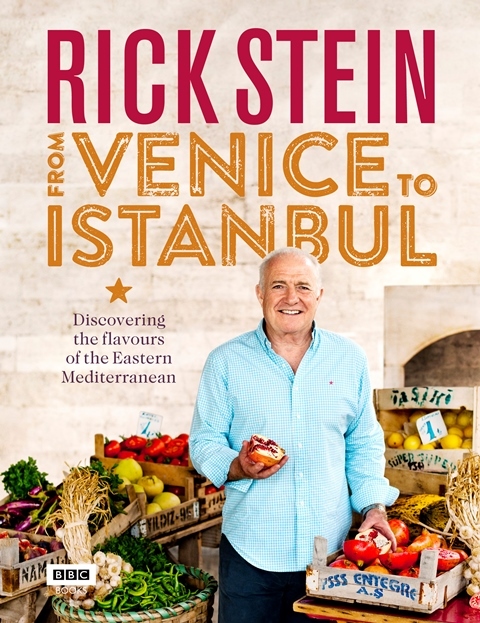 In his most recent book, From Venice To Istanbul, Rick Stein discovers the flavours of the Eastern Mediterranean. In the introduction he mentions a restaurant in Venice whose menu states no pizza, no lasagna, no menu touristico. These are the restaurants we seek out all over Europe to ensure we eat where the locals eat. And this recipe book is about cooking what the locals cook, all influenced by the Byzantine era. The photographs are stunning but not every recipe has a photograph, and not all of the photographs are relevant to the recipe, or even on the same page as the recipe. Rick’s anecdotes at the beginning of each chapter tells a story personal to his experience. He provides us with the English name of the dishes as well as the traditional language name of the recipe where relevant. He also lets us know which country the recipe originates from. Starting with mezze I would like to try the muhammara (p20) as well as the roasted beetroot with almond skordalia & white anchovies (p27), pide bread (p32), strained yogurt with cucumber, garlic, mint & dill (p35), prawns alla busara (p55) and Petros’s clams (73). Moving on to street food the Turkish king of breakfasts: eggs with tomato, red pepper & green chillies (p82) sounds amazing. I can see myself devouring çilbir (p84) and top of my list is the loukaniko sausage meat (p87) as you can never have enough sausage recipes to use. I have thought also about making the piadina (p91). 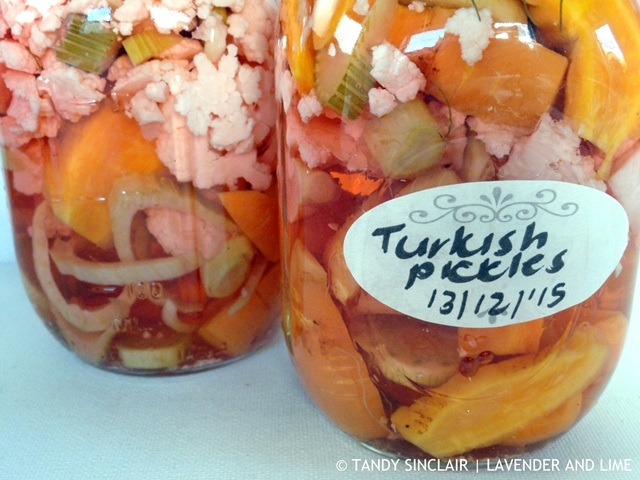 I used vegetables from my garden to make the Turkish pickles (p102). These turşu are served alongside grilled meat and stuffed flatbreads and are divine. Following on from this is the chapter on meat and beef with oxymeli (p117), sporki macaroni (p121) and Turkish dumplings (p126) all caught my eye. I like the sound of the passatelli (p128) and the ragù Bolognese (p129), as well as the lamb kleftiko (p140) which I have eaten but never made. Another dish I could make in winter would be the slow-cooked pork knuckle & onions (p158). 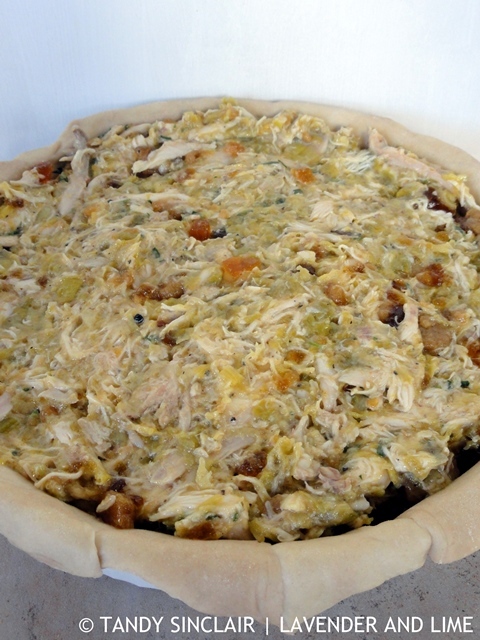 In the section covering poultry the best chicken pie in Greece (182) has been adapted slightly and I totally agree with Rick, it is the best chicken pie! We have eaten at a fish and chip shop in Oban based on his opinion so I never doubted him for a moment. Given that sumac is one of my favourite spices to cook with I will try the oven-roasted chicken with sumac, pomegranate molasses, chilli & sesame seeds (p185). Rick reckons that in this book, this recipe will be the most popular one. Finishing off this chapter I would also try the chicken yufka (p194) before moving on to the seafood where the grilled mackerel stuffed with hot red pepper paste, parsley & garlic (p204) will be given to Dave to make. If I can get crab I will make the gnocchi con granseola (p226). We get the most amazing fresh mussels so I can make his recipe for butriut mussels (p220). I shall try the bigoli in salsa (p229) or even the cassopipa (p230) as well as the seafood linguine (p235). And for a cold night in, the seafood risotto (p237) needs a go. Rick’s favourite dish from the entire trip was black risotto (p238) eaten in Croatia. From Venice To Istanbul includes vegetarian & sides recipes and the third risotto recipe I am going to make is the risotto alla torcellana (p246). Moving on to pasta, the spinach & ricotta ravioli with wild mushrooms sauté (p251) would easily be made in my kitchen. The penultimate chapter covers desserts and the Croatian sour cherry strudel (p279) would be my treat to myself as Dave is not fond of cherries but I love them. For both of us I would make the Dalmatian fresh fig tart (p285) as well as the Greek almond cookies (p289) or the Pistachio baklava (p305). 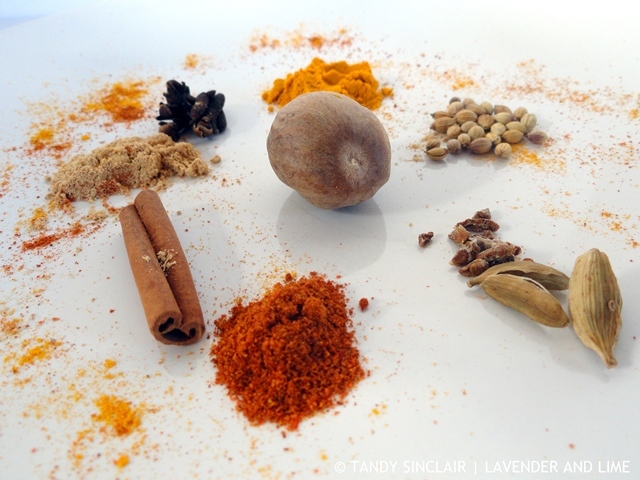 Ending off with extras which include recipes for stock and dough, I made the Byzantine spice mix (p307). I was not sure how to slice my nutmeg so I used a good few grinds of fresh nutmeg, grinding my finger at the same time! I doubled his recipe and I must say that it smelt divine as I blitzed it in the spice blender. The book finishes off with an ingredients glossary and cooks tips which includes using a microplane to grate garlic with the skin on which I have tested and it works amazingly well. Hard cover – 319 pages including the index. Hi Tansy, been a while since I visited but when I googled Turkish recipe books you appeared. We arrived back from Greece/Turkey yesterday and I’m itching to try some recipes. Are you still pleased with this book? I’ve collected a few from locals but U like the way Rick tells stories as well as shows the goods. Cheers, Maree. Hi Tandy, sounds like an amazing book, I know I would love it. Maybe you can get a copy to review as well? I really think you will enjoy it! Looks like a great read filled with tasty recipes! Very much my kind of book with this food exploration. Loving the Chicken And Leek Katmer Pie! I really wanted this book after seeing the TV series and I was lucky enough to have been given it for Christmas – love it and find it very inspiring! I do think when visiting other countries, eating like a local is pretty thrilling. I’m a bit of a food wimp though so the no pizza thing might kill me. But try everything once, right! I would have to say that Eastern Mediterranean food is one of my favourites, so this sounds like my kind of book. I am obsessed with turkish food at the moment. This book is perfect for you then! Whilst I certainly don’t need another cookbook, I do love Rick Stein. His delivery (whether on film or in writing) is just so calm and laid back. The pie filling looks good. I have been a huge fan of Rick Stein since his book on Indian food and also the tv series hit the screen, and love this book as well. His autobiography is a great read too though I have never been to any of his restaurants in Pads tow. I must look for his autobiography!